Description: Hypoestes phyllostachya is a delicate tropical foliage plant for indoor. Hypoestes phyllostachya can grow quite big, its maximum suitable height and spread are about 38 cm, for it tends to become straggly with age and should be replaced by a yang specimen. 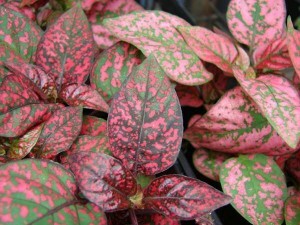 The pointed-oval leaves are 6 cm long and 4 cm wide, dark olive green heavily spotted with light (but conspicuous) pink markings and arranged in opposite pairs on 4 cm long leaf-stalks. Short side-growths generally develop from every leaf axil, making the plant dense bushy. In early spring small lilac-coloured flowers are produced, but they are insignificant and can simply be removed. Hypoestes phyllostachya can be used as an accent plant in dish gardens, window boxes or patio containers or can be grown as a bedding plant to add some color in partially shaded areas.